How many of your phones would unlock if I tried 0451? 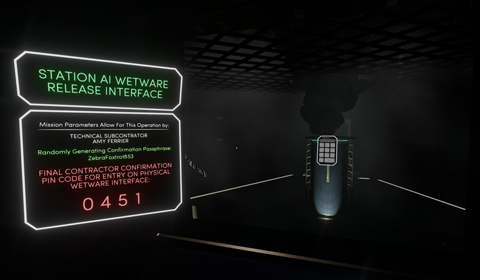 In the later stages of Fullbright's Tacoma, you have to enter the code 0451, a set of numerals that has become synonymous with a lineage of games labelled as immersive sims (as explained in this video). Such games generally offer a specific set of tools and systems so that their interaction provides emergent, open-ended gameplay – unpredictable results from the combination of predictable variables. Tacoma decidedly does not fit that sandbox gameplay mould, but its inclusion of 0451 is more an homage to the overall legacy of immersive sims rather than a desire to be lifted into their pantheon. There are in fact a few recurring narrative elements inherent to immersive sims that Tacoma unifies and streamlines with a very clever conceit. Welcome to Playthroughline, a personal blog focused on the implementation of stories in games. In addition to general musings about narrative design, you’ll also find a collection of scripts that basically do for videogames what The Editing Room does for movies.